New experiences are an intrinsic part of travel. Whether it’s a trip to New Orleans, Vancouver, or Guangzhou, China, when you go somewhere for the first time, you are opening yourself up to the many possibilities that different places hold. Yet often some of the most memorable moments occur when you discover a sight from home in an unexpected place. It’s like rounding the corner in a strange city to find your favorite coffee shop nestled next to an ancient monument. Dessa leads the audience in a rap created from a Chinese tongue twister. Photo by Wilson Tong, courtesy of Guangzhou Opera House. 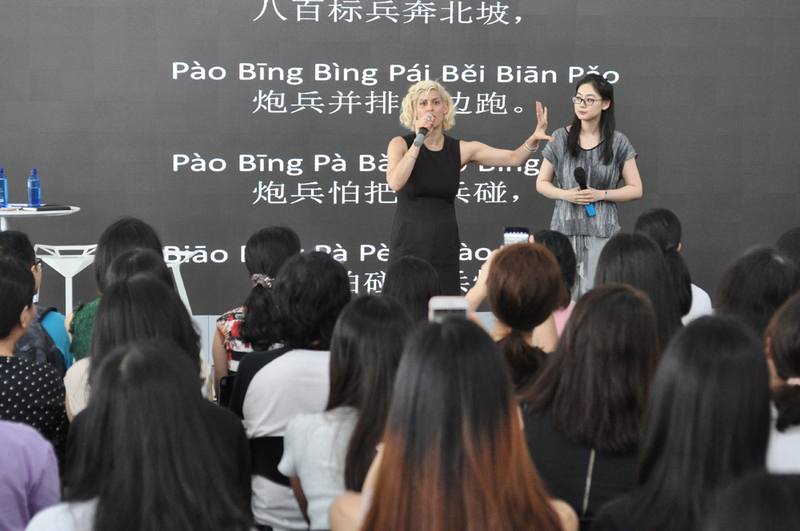 On Saturday, May 26, Dessa, Aby Wolf, and Matthew Santos conducted a workshop at the Guangzhou Opera House, where Dessa explained to the audience her writing process and shared tips for creating new rap songs. 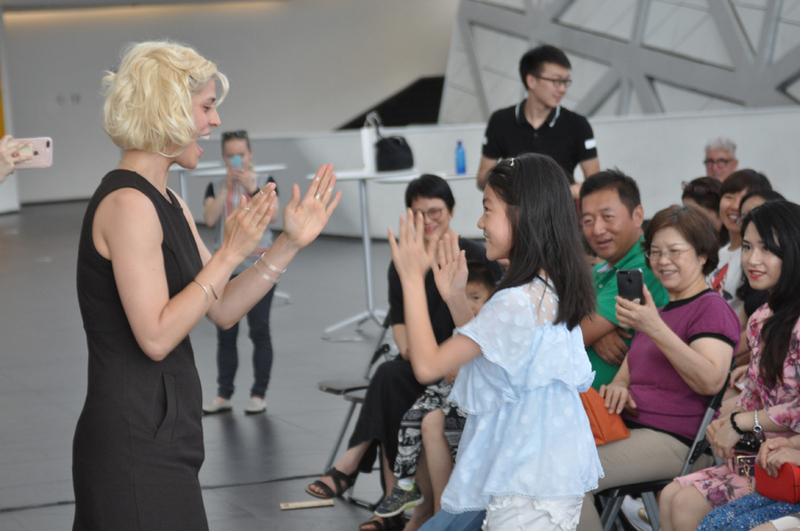 Dessa plays a hand clap game with a member of the audience during the workshop at Guangzhou Opera House. Photo by Stephen Manuszak. To demonstrate this concept, Dessa collaborated with the audience. She enlisted the help of one girl to teach her a hand clap game. From the game’s rhythm, Dessa was able to create a beat and freestyle along. She also led the audience in a short rap. Working with her fellow musicians and the group’s interpreter and tour manager, Yu Pei, Dessa set the words of a Chinese tongue twister to a sample of a popular song. Soon, Dessa and the audience were rapping in unison—or at least close to it. A tongue twister suddenly set to a new beat. A Starbucks next to a Buddhist temple. An American rapper at a Chinese opera house. Dessa leads the audience in a rap created from a Chinese tongue twister. Photo by Stephen Manuszak. Just as travel involves encountering the familiar in a new setting, so, too, does rap music. And just as each new place contains many possibilities, so, too, does each new song. As she’s journeyed across China through this Arts Midwest Global Exchange, Dessa has experienced this juxtaposition of old and new over and over again. And on Saturday, when she engaged the audience in creating rap music, residents of Guangzhou also saw the familiar in a different light.